Russia has enough reserves of energy carriers to satisfy the needs of its own and those of European consumers for 100 years ahead, Russia’s Prime Minister Vladimir Putin stated. “One may either have gas or may not have gas. Russia has it. The resources will be enough for Russia to satisfy our growing needs and the needs of our European consumers for at least 100 years ahead. 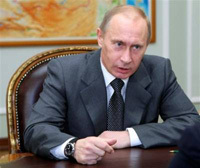 I am absolutely responsible for what I am saying, and I rely on serious research works at this point,” Putin stated at a press conference after meeting with Prime Minister of Hungary Ferenc Gyurcsany in Moscow. Russia and Hungary singed a package of documents in Moscow about the construction of the Hungarian section of the South Stream gas pipeline, as well as about the construction of gas-holding facilities in Hungary. The head of Russia’s Gazprom Aleksei Miller and the President of the Hungarian Development Bank Janos Eros signed the basic agreement on cooperation, the construction of the pipeline and the transit of the natural gas via Hungary. The document stipulates the establishment of a joint venture. The underground gas-holding facility, which Russia’s Gazprom will build in cooperation with Hungary’s Mol, will be capable of storing over one billion cubic meters of natural gas. “This is a large amount that will guarantee the energy security and stability of the entire energy industry of Hungary,” Putin said. The storage facility is to be put into operation by 2012-2013, whereas the construction of Hungary’s section of the South Stream pipeline is to be complete before 2015. Hungary officially joined the project at the end of February 2009, Itar-Tass reports. The perspectives of Russia’s South Stream project made Putin recollect the attempt of the Ukrainian authorities to withdraw the contract of the transit of the Russian gas. “It only discredits the country and makes one think about alternative ways of delivering our hydrocarbons,” Putin said. The chairman of the Russian government said that the construction of other pipelines similar to South Stream could only discipline all transit countries. “Our partners from Eastern Europe may count on the financial support for trade and investment operations on Russia’s part,” Putin said. “Russia’s investments on the market of financial services on the post-Soviet space are evaluated at billions of dollars,” Putin reminded. He said that Russia was a long time partner with its neighbors and arranged a two-billion-dollar loan for Kyrgyzstan, a 150-million-dollar grant and a preferential 300-million-dollar loan for this country. In addition, Russia will give a billion-dollar loan to Belarus .